students enrolled in our summer program. 90% of post tests showed students successfully fought off the "summer slide" by maintaining or improving assessment scores in literacy and math. of seniors in Urban Ventures Young Life, our high school mentoring program, graduated on time (compared to less than 57% for students of similar backgrounds). Act Six Scholars are attending or have graduated from six partner schools on full-tuition, full-need leadership scholarships worth more than $25 million over four years. Angel, Alva, and Concepcion are moms-to-be. For 12 weeks this spring, they learned more about pregnancy and newborn care at Urban Ventures’ Center for Families. Along the way, they became a support system for each other in this exciting, yet uncertain, time of life, and once their babies are born, they have a community to lean on. Green Central is one of two schools directly inside Urban Ventures’ 25-block core focus area. 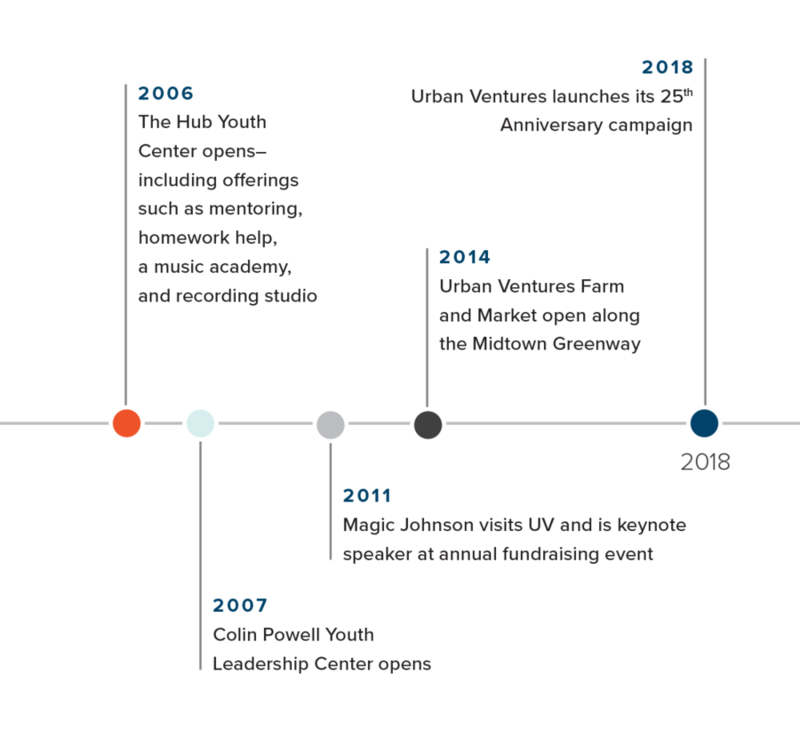 The school is one of more than 80 academic institutions, government agencies, and nonprofit partners with which Urban Ventures has a referring relationship. basketball and soccer teams used sports to build character. music lessons and recording studio sessions. Act Six scholarship recipients elected student body presidents. I wouldn’t have made it to college without Urban Ventures. Without ongoing support from Urban Ventures, I wouldn’t be making it through college, either. households attended weekly programming as a family. report UV helped change their family’s trajectory. report they improved their parenting skills. report spending more time reading to their kids. pounds of produce grown and distributed by 15 neighborhood youth through our urban farm. households learned more about UV through our Family Fest and other outreach events. households in our 25-block core area. All received information about UV and an invitation to join us. nonprofit and community organizations with a cross-referral partnership. households, corporations, foundations, and churches donated in 2018.
volunteers served a record-setting 15,784 hours. Urban Ventures Coffee Company partners. On October 25, 900 friends, neighbors, and colleagues gathered with the goal of raising $1 million. 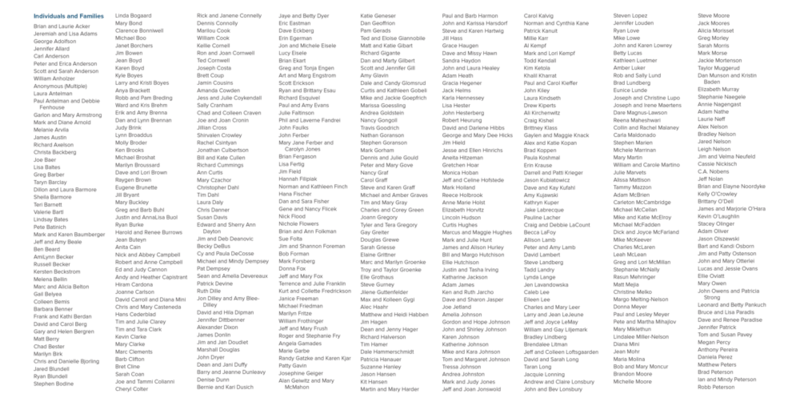 You blew past our goal and unlocked an incredible 465 new openings in Urban Ventures' cradle-to-career pipeline. Additionally, this fully funds the 750 children already engaged in Urban Ventures programs. For additional financial information, visit urbanventures.org/financials. Thank you for an incredible 25 years! All the photos in this report are of real Urban Ventures participants and community members. All quotations express the views and experiences of Urban Ventures program participants, though not all quotations are directly attributable to the individuals photographed. We make every effort to ensure the accuracy of this list. If you notice an error or omission, please notify our Advancement Office by calling 612.545.9880.